We stock the full range of Geoff Nutkins prints, from Pilot Portraits to the Collector's Editions. Geoff's works are displayed in collections around the world, and in such renowned institutions as the Royal Air Force Club in London. The images below are just a small selection of the prints we have available. For the full range, browse the Avi-Art Prints collections using the buttons on the left. Images shown are a representation only. Actual prints are of the highest quality. Flight Lieutenant Tony Cooper of No.64 Squadron patrols the skies above the Normandy beaches with his wingman, June 1944. One of our most popular prints, each is individually signed by Tony Cooper. Flight Lieutenant Colin Perkins of No.107 Squadron in his Mosquito Mark IV 'buzzing' his home village of Collyweston after safely returning from a sortie. Sergeant Ray Holmes of No.504 Squadron rams a Dornier 17Z over London on 15th September 1940. Each print is signed Ray Holmes and three other distinguished Battle of Britain pilots. 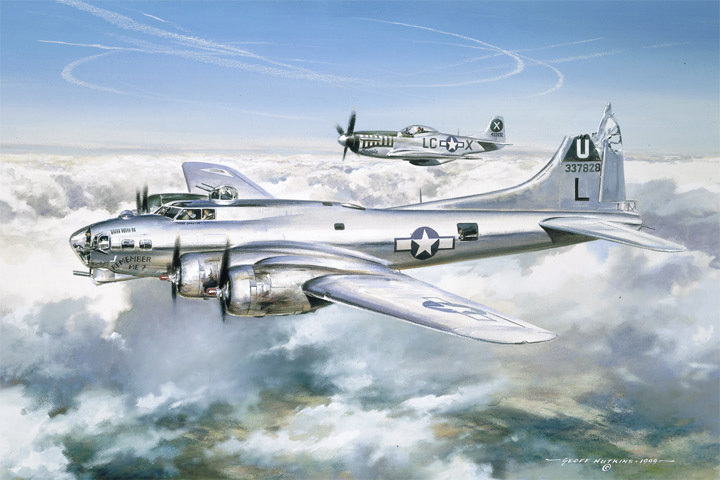 The heavily damaged B17G Flying Fortress "Remember Me?" of 457th Bomb Group homeward bound to Glatton airfield in England, 1944. Each print is signed by the pilot, Captain Charles E. Barrier. The images above are just a small selection of the prints we have available. For the full range, browse the Avi-Art Prints collections using the buttons on the left.